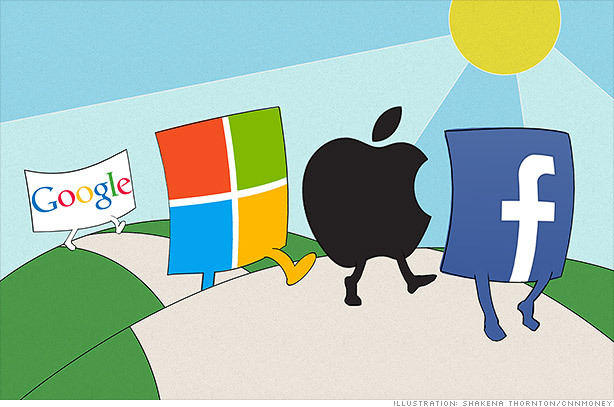 Google's stock has lagged Facebook, Apple and Microsoft lately. But just like the tortoise and the hare, slow and steady may win the race. It may seem odd to call a company that's worth $285 billion, has a dominant share of its market, and projections of 15% annual earnings growth for the next few years an underdog. But lately Google (GOOG) has fallen out of favor with investors. The stock is down nearly 8% since it hit an all-time high back in mid-July ... just before Google reported earnings that disappointed investors. That's obviously not a dramatic sell-off. But it is getting close to a technical 10% correction. And Google has lagged both the broader market and some of its key rivals. The Nasdaq has been flat since mid-July. Meanwhile, Facebook (FB) has surged nearly 60% since its late July earnings report on mounting evidence that it will be a huge force to be reckoned with in mobile advertising. Apple (AAPL) has bounced sharply off its 52-week lows and has gained 20% during the past few weeks on better-than-expected earnings and growing hopes for the new iPhone and iPad ... which will be unveiled next month. The endorsement from hedge fund manager Carl Icahn, who tweeted earlier this month that he bought a "large position" in Apple and is pushing CEO Tim Cook for a bigger stock buyback, obviously helped too. Even Microsoft (MSFT), which tanked the day after a poor earnings release last month, has since rebounded. The stock popped late last week after CEO Steve Ballmer announced he would be retiring sometime within the next 12 months. The only Google rival that hasn't done that well in the past month is Yahoo (YHOO). Like Google, shares are also down about 9% from their 52-week high. It's possible that investors may now want CEO Marissa Mayer, who's been busy buying Tumblr and some smaller start-ups, to do more than just provide some sizzle. They actually want her to deliver the steak. And by that I mean, real evidence of a sustainable turnaround in ad sales and earnings. Still, Yahoo has been a better stock than Google this year. But don't get me wrong. Google is still doing extremely well in 2013. It's up a more than respectable 20% year-to-date. So if anything, the recent Google weakness may be a good buying opportunity. Google often has stretches where its stock gets overlooked because the company is so dependable. Google never had to convince investors that it understood mobile. Google is still a young enough company that it won't face calls from activist shareholders to start buying back stock or pay a dividend. And nobody is demanding that CEO Larry Page step down. But Google is far from perfect. The company's wearable Google Glass still looks more like great fodder for jokes than a product that might actually generate strong sales and profits. It's not clear if Google will ever come up with a way to supplant Facebook in social media. And the company may soon have to worry a lot more about how much of a force a publicly traded Twitter could become in the online ad market. And for all the market share success that Google has had with its Android operating system, the jury is still out on whether the company's foray into hardware through its $12.5 billion purchase of Motorola Mobility will turn out to be a stroke of genius or a colossal writedown waiting to happen. Finally, there's the corporate governance issue. It's unfortunate that Google has chosen to concentrate most of the decision making power for the company in the hands of just three people. Page, fellow co-founder Sergey Brin (who appears to be the Eric Clapton of tech in a convoluted Layla-esque love triangle) and chairman Eric Schmidt. Of course, Google is not the only company to have a dual class stock system. Facebook does too. And you can argue that Page, Brin and Schmidt deserve the benefit of the doubt. They've been undeniably successful in managing the company since its initial public offering nine years ago. That's why I think Google, despite its flaws, still may be the best bet of all its competitors. It has the ideal combination of a reasonable valuation and strong growth. Google trades for just 17 times 2014 earnings estimates. Profits are expected to increase 18% next year. Yes, Facebook's profits will increase at a faster clip. Analysts are forecasting a 34% jump in earnings in 2014. But that should happen, given that Facebook is a younger company. And even with Facebook's growing clout in mobile, its stock looks a lot riskier. Shares trade at nearly 45 times next year's earnings estimates. Next up? Apple. It's cheaper than Google and trades for less than 12 times fiscal 2014 earnings estimates. But there are legitimate questions about its future. Earnings are expected to climb only 8% in fiscal 2014 after a drop this year. Microsoft? Also trading at just 12 times next year's profit forecasts. But we don't even know who the next CEO will be and what direction he or she will take the company. I'll pass. That leaves Yahoo. Mayer has obviously changed the culture and made Yahoo cool again. And it is slightly cheaper than Google, trading at 16 times 2014 earnings estimates. But at some point, investors are going to demand better results and won't be satisfied by more acquisitions. So there you have it. Google may be out of favor right now. But it shouldn't be for long. Reader Comment of the Week! The hacking of The New York Times website was big news this week. One Twitter follower joked that the company may need to invest more in newer technology.
.@lamonicabuzz Could someone politely ask the New York Times IT department to upgrade their server from Windows 95 to Apache Linux? Ha! That's an unfair potshot at a well-received Microsoft product though. Perhaps the Grey Lady was running on Windows Vista?